Its 11 degrees today. I look outside and the skies are dark and I am sat here looking at very expensive shorts – not denim shorts. When will the Sunshine come back to England? I hope these posts are giving you some shopping inspiration, because they are for me. 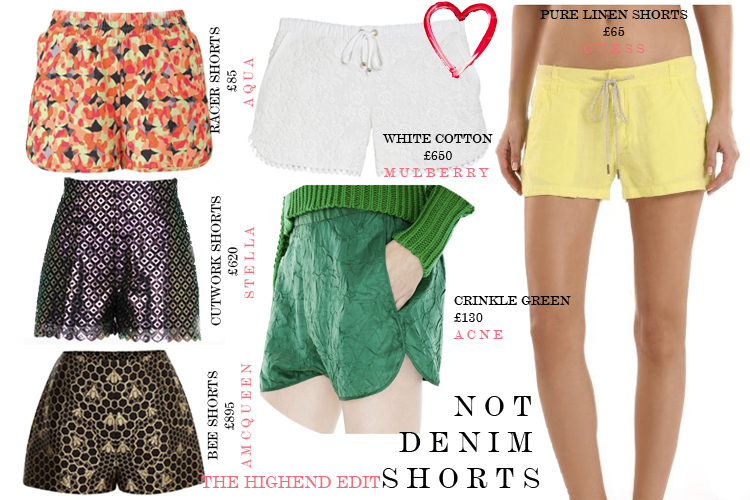 My favourite are the White Cotton Shorts by Mulberry. If I had £650 spare I would invest… maybe. Its a lot of money for a pair of shorts – but its the weekend so we can dream. I think the Guess ones are a really affordable designer pair. And they look very light – perfect for the beach or on holiday. Last night I went to the WIWT blogger event. It was hosted in The Covent Garden Ministry Of Waxing. We went had a table at the Cocktail bar called Circus – imagine acrobats dancing in the middle of your table. It was a great experience, not only to have my first wax but to meet other bloggers. I will have a full post about this over the weekend. Outfit post will be up later today. Have a great weekend.